iRobot has started a new marketing campaign, which coincides with the re-design of their website. It features a contest on YouTube where you can submit a video of yourself dancing like a robot to a song you download from their site (song is available here). The company will be giving away 20 Roomba vacuum cleaning robots to winners, and will also be giving three of the finalists a limited edition trophy. 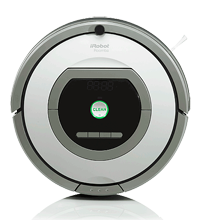 We’re hoping that they’ll be giving away the Roomba 780. You can enter here. Entries must be less than a minute long and be submitted before May 13.